Today, as I had a free day (with 24 hour daylight!) in Reykjavik before the NBBC15 conference started, thanks to the crazy schedules of the low cost sister of Air France, Transavia (! 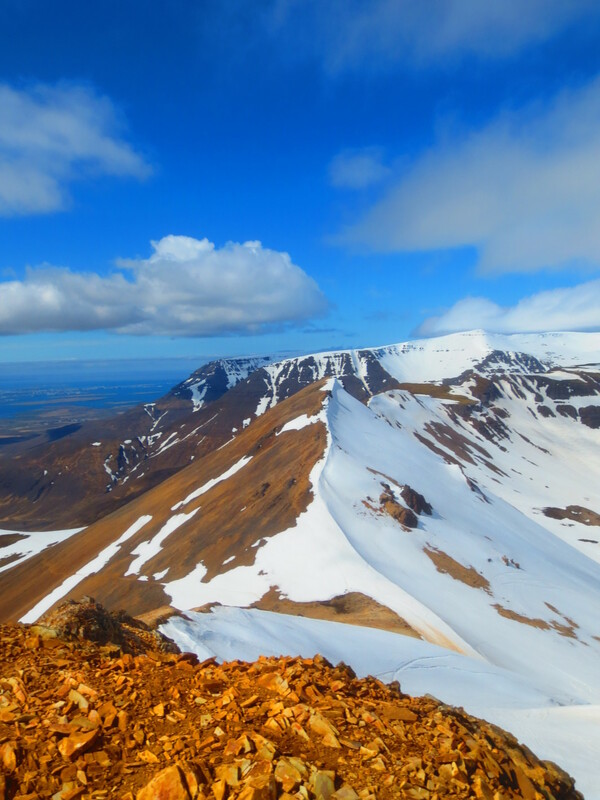 ), I went in search of a hike… Which is not very difficult in Iceland! I had originally planned to stop near Geysir as the dirt road beyond Gullfoss is off-limit for rental cars. Especially small 2WD like mine. 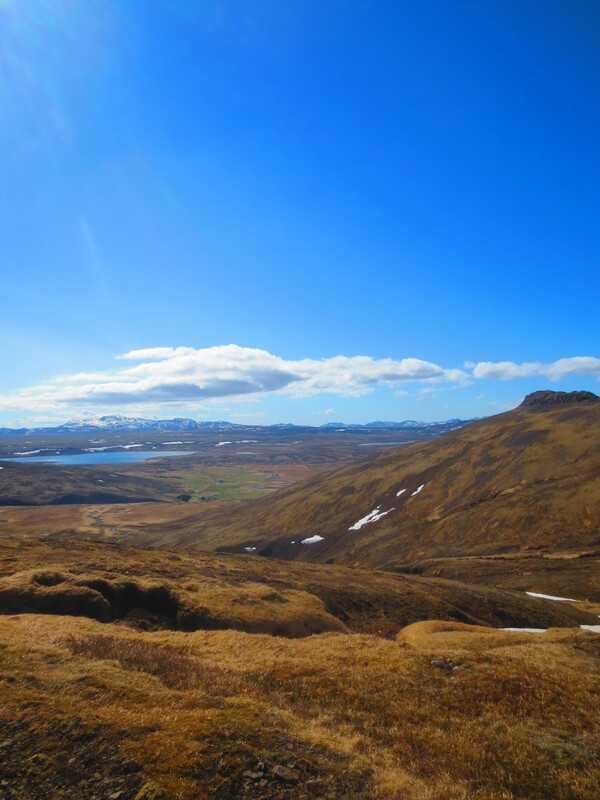 As I was driving the first kms of the Þingvellir road, I admired the Esjan range starting with the Esja mountain that we had climbed during our previous visit to Iceland. 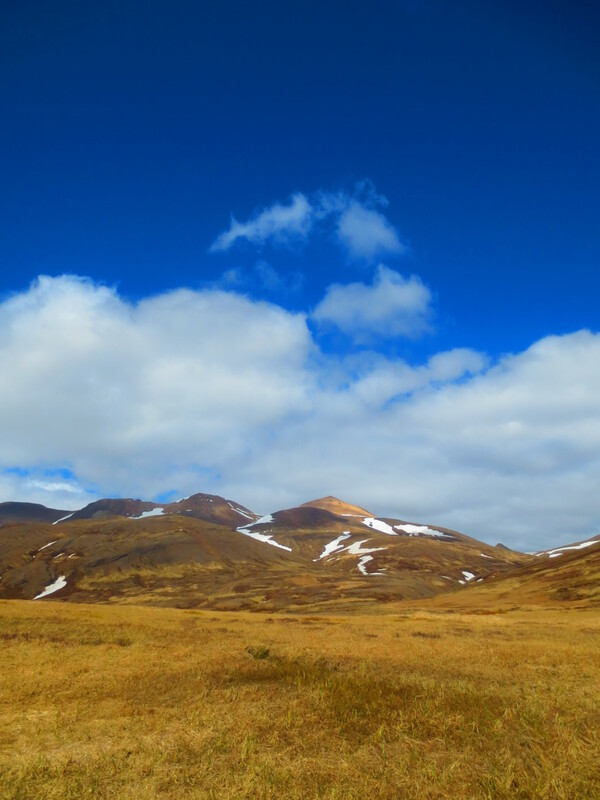 Especially the “last” peak that glowed with a warm yellow (and apparently no snow at all). More especially, because it had a top reminding me of the Old Man of Storr on its slope. (Not that I could spot it while driving!) And quickly decided this was a great opportunity for a nice hike and a minimum of driving as I was about 20 mn from down-town Reykjavik. 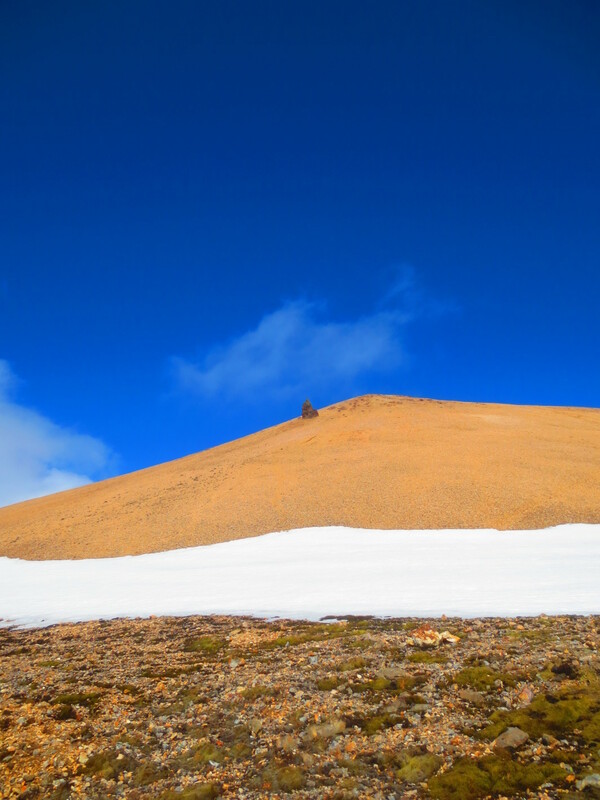 I thus took a dirt road that seemed to get closer to my goal and after 500m came to a farm yard where I parked the car and went hiking, aiming at this peak, which name is Móskarðshnjúkar. Despite a big cut due to a torrent after the first hill, I managed to keep enough to high ground not to loose any altitude and sticking to the side of the ski station Skálafell (where a few people were still skiing with the noisy help of two snowmobiles), I crossed the brook easily as it was covered by snow and started moving to steeper if manageable slopes. 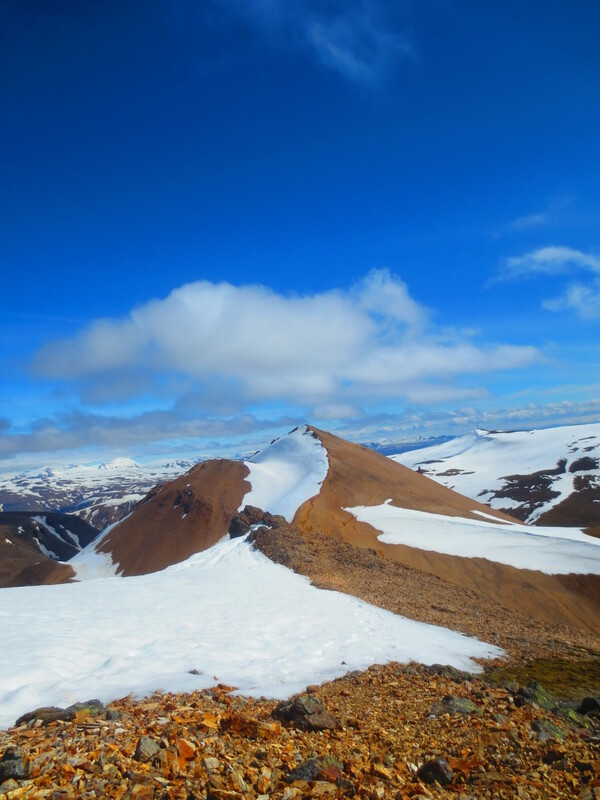 I reached the bottom of the main peak rather quickly and then understood both its colour and the absence of snow. 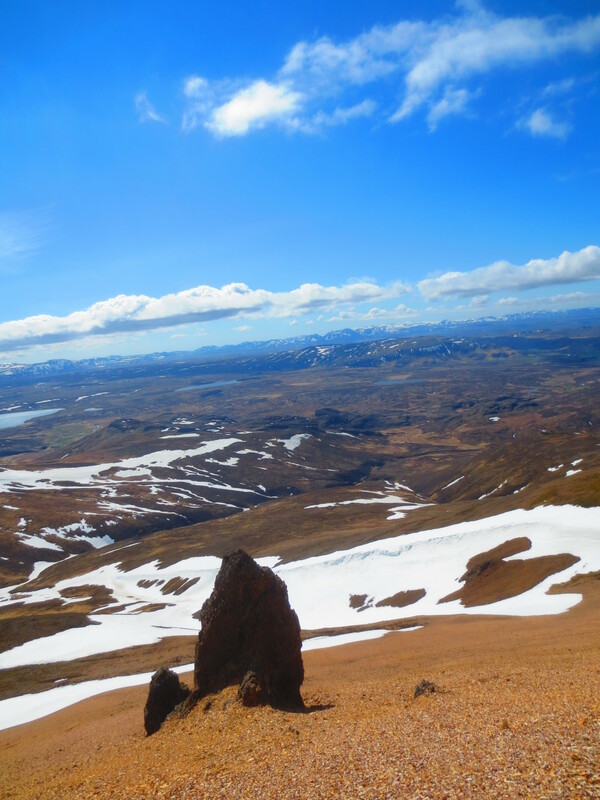 A last sight was provided by the final rocky outcrop, which enjoyed basaltic volcanic columns as on the picture above. A terrific hiking half-day with a sharp sunny weather and not too much wind except at the top. 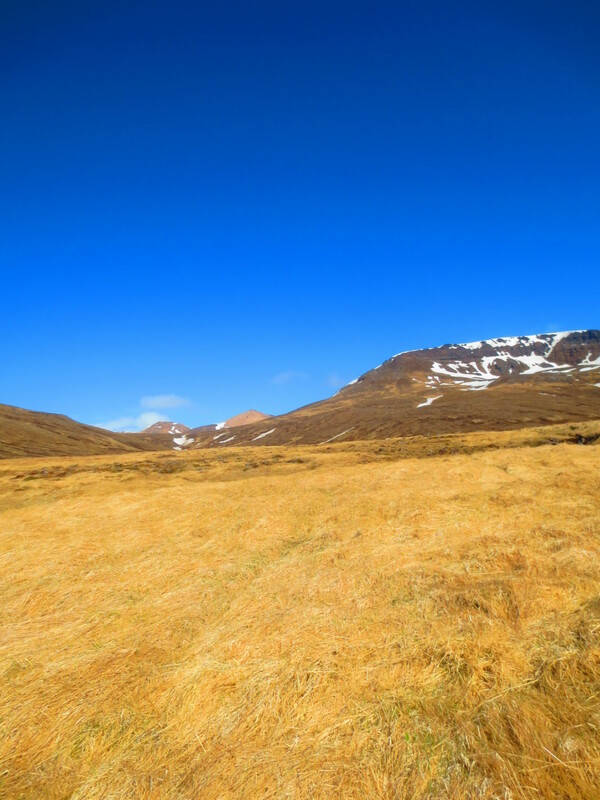 It was very pleasant to walk part of the way on moss and last year grass, with a surprising absence of bogs and mud when compared with Scotland. 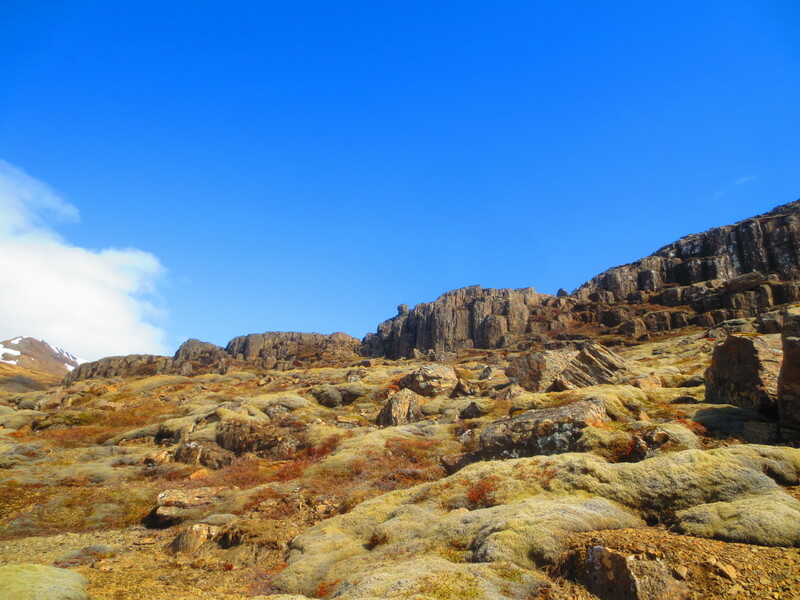 This entry was posted on June 7, 2015 at 12:15 am and is filed under Mountains, pictures, Running, Travel with tags Þingvellir, Esja, hiking, Iceland, Móskarðshnjúkar peak, Reykjavik, Scotland, volcanoes. You can follow any responses to this entry through the RSS 2.0 feed. You can leave a response, or trackback from your own site.